With recent shifts in U.S. policy, Cuba presents an opportunity to expand corporate revenues, foster entrepreneurship and stimulate the economy for the good of the people. However, the island nation presents a much more uniquely challenging marketplace for those seeking new business opportunities. The panel will provide first-hand insight needed to navigate the unique political, legal and reputational challenges of operating in one of the world’s most complex business environments. The panel will also discuss specific case studies of U.S. companies currently operating in Cuba and valuable lessons learned associated for companies and individuals with an interest in expanding business to Cuba. Alana Tummino is director of policy and head of the Cuba Working Group at Americas Society and Council of the Americas (AS/COA) and a senior editor of the policy journal Americas Quarterly. In these roles, Tummino leads work on Cuba’s changing economic and political landscape and relations with the United States, and helps businesses navigate and understand the changing regulatory framework and investment opportunities. She is a frequent commentator on Cuba for various news outlets and publications. Among her publications, Tummino authored "Cuba: Open for Business, But... ," "Obama's Cuba Policy Is Change We Can Believe in," and "Cuba's New Business Class." She additionally works on topics such as social inclusion and natural resource extraction. She is a founding member of the organization’s Young Professionals of the Americas network. Prior to joining AS/COA, Tummino worked with various international development organizations on microfinance and women’s economic empowerment. She is the Financial Women’s Association graduate scholar recipient for microfinance, as well as the Foreign Language and Area Studies fellow for Portuguese and Latin America from the U.S. Education and State departments. She received an MA in economic and political development from Columbia University’s School of International and Public Affairs, and received her BA in political science and Spanish from the George Washington University. Mr. Harvin, who was recognized as one of the top public relations practitioners under 40 by PRWeek in 2013, has served the White House and has held senior communications and public affairs positions with the Secretaries of Defense and Veteran Affairs, Members of Congress and the Coalition Provisional Authority in Iraq. He has represented multiple Heads of State, corporations, and sovereign governments in emerging markets around the globe. Mr. Harvin serves as a Board Member and Advisers to the Washington Inter-Governmental Professional Group, a DC-based organization with over 3,000 members from the private sector, diplomatic community and staff members from Congress and the Federal Agencies. He is a Member of the Board of Advisers for the Department of Communications at Georgia Southern University, is a Member of the Board of Advisers for The Alliance for the Restoration of Cultural Heritage (“ARCH”) International, Inc. and is an active member of the Public Relations Society of America. Mr. Harvin is a native of South Carolina, he resides in Washington DC. In 2013, Mr. Harvin presented as a panel expert on the influence of social media in the Middle East at SXSW during the presentation "I Overthrew My Governemnt: Now What?" 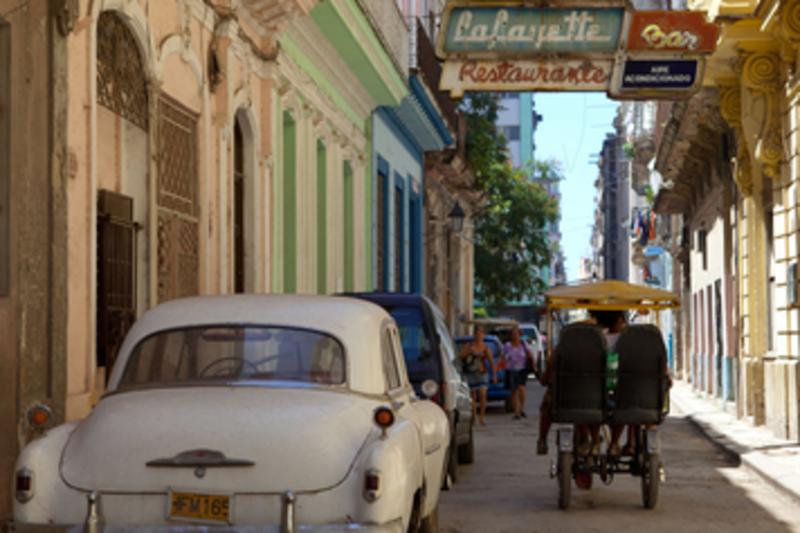 Cuba presents unique challenges for all foreign investors—and for U.S. investors, in particular. Success requires holistic approaches that incorporate U.S. legal considerations, potential political ramifications of pursuing opportunities in Cuba, and managing downside risks with regard to reputation management. But that's only half the story; the other half is understanding Cuba's priorities and how to operate effectively on the island. Matthew helps clients identify and pursue opportunities at the nexus of Cuba policy and business by leveraging his years of experience working on Cuba and relationships in both Washington and Havana to help clients identify opportunities and develop concrete strategies to achieve their short-, medium-, and long-term goals. During his years at the Council of the Americas (2009–2012), Matthew led efforts to unite senior U.S. business executives with officials from the U.S. departments of State, Commerce, Treasury, and the National Security Council to discuss topics including financial services, telecommunications, energy, pharmaceuticals, hospitality, and agriculture. Matthew is a recognized authority on the legal and regulatory frameworks comprising the U.S. embargo on trade with Cuba and frequently accompanies clients on trips to the island. Tomas Bilbao is Managing Director of Avila Strategies LLC a public affairs consultancy that protects and enhances clients’ reputations by anticipating risks, building strategic relationships with stakeholders, and ensuring effective communication of value propositions to relevant interest groups. Mr. Bilbao is a public affairs executive with over a decade of experience in shaping public policy. With experience in the legislative and executive branches of federal government and the non-for-profit and corporate sectors, Tomas has designed and executed successful campaigns that have positioned clients to influence and take advantage of emerging challenges and opportunities. A recognized subject-matter expert on U.S.-Cuba relations, Tomas has advised top Cuban-American executives and led a public policy campaign that played a key role in the historic shift in policy announced by President Obama in December 2014. He has launched and supervised groundbreaking social projects in Cuba, helping his clients make a positive impact on the ground while advancing their goals. By leveraging key relationships and building coalitions, Tomas has helped industry leaders influence U.S. policy changes in the areas of banking, telecommunications, travel, and hospitality and microenterprise development. As a consultant to Fortune 500 companies, Tomas has helped provide business intelligence in the areas of reputation management, crisis mitigation, political risk assessment and communications. Tomas has been widely published in, and appears frequently on, national and international media outlets. He holds a degree in International Studies from American University in Washington, DC and an M.B.A. from the Kellogg School of Management at Northwestern University. Mr. Bilbao is a Senior Associate at the Center for Strategic and International Studies and term member of the Council on Foreign Relations.